Bulk export cargo flows from South Africa showed moderate growth of 2.8% in 2013 following a number of years of above- average growth. In many respects, this was less to do with any global market weakness and more to do with infrastructure constraints which have been building for a number of years. This can also be viewed as a pause more than longer-term demise, as there is numerous capacity drivers in play which will push volumes further in future years and this has been reflected in the summary below. Whilst volumes of iron ore through Saldahna were perceived to have declined marginally in 2013 this was offset by good growth in coal exports from Richards Bay and general bulk growth from Durban. The forecast for the period 2014–2015 should deliver some marginally improved volumes with better growth rates as some of the significant Transnet port and landside infrastructure projects start delivering extra capacity. This however is only marginal and will flatten during 2016–2018 until the full impact of improved rail and port infrastructure is delivered by 2019 notably for coal and iron ore. This is tabled below with the main port exports and we have introduced a likely picture of what 2019 should look like. This reflects Saldahna and Richards Bay rail capacity both reaching 81mtpa (million tonnes per annum) whilst the new manganese ore terminal in Nqgura in the Eastern Cape will go live also at this time and deliver large bulk volume. On the industrial front 2013 was another difficult year for the South African mining industry but again this was largely confined where Transnet Engineering itself could reach OEM status and start exporting locomotives to markets overseas in the future. The majority of the locomotives are actually going to be to the platinum and gold sectors however an unhealthy landscape exists in this area not helped by government, the private sector and labour who seem unable to find common ground. The positive aspect is also that the bulk of these orders will be assembled at Transnet Engineering with minimum 55–60% local content programmes and also with a skills transfer to the point where Transnet Engineering itself could reach OEM status and start exporting locomotives to markets overseas in the future. The majority of the locomotives are actually going to be deployed in Transnet Freight Rails (TFR) general freight business which does not include the company’s dedicated heavy haul lines for iron ore and coal (which are relatively well supplied already). There is an allocation for more trains required on the Manganese line (see later). TFR expects to increase the current 207 million tonnes of freight to 350 million tonnes once the order is complete. The average age of the TFR fleet was currently 32 years so this implies there will be at the other end a clearing out of older stock but given the higher maintenance level of older units offset by less from a younger fleet this will still assist TFR with asset utilization. Therefore whilst the growth levels in freight might seem rather ambitious the facts are that a more efficient rail network will result and quickly will help both general freight and bulk hauls. 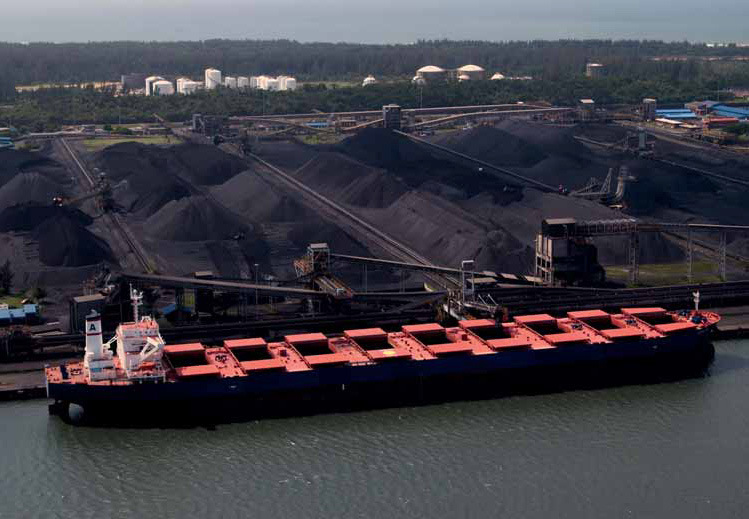 The global seaborne steam coal trade grew by a much slower 3% in 2013 to reach 849mt (million tonnes) and is set to increase by 4% in 2014 to reach 885mt. This growth driven by both China and India has slowed somewhat in recent years and potentially not assisted by the low price of steam coal today. The long-term growth of this product is however solid and whilst RSA exports have lagged behind global trade they did post a new record in 2013 through Richards Bay Coal Terminal (RBCT) with a lift of 70.2mt. This is the first time that 70mt has been reached but still falls short of terminal capacity of 91 mtpa. Elsewhere Durban loaded a further 1mt whilst 2.5mt moved through the TCM Maputo (Matola) gateway. Transnet Freight Rail (TFR) has delivered better volumes into RBCT as part of its commitment but these are only likely to reach 81mtpa by 2018 in line with the market demand strategy on rail. The export of steam coal through South Africa’s main three gateway ports is detailed above. Whilst Transnet is looking at developing its own terminal capacity in Richards Bay with up to 32mtpa capacity, this does seem somewhat short-sighted when considering the extra capacity already available at RBCT and the key is to ensure ongoing improved rail delivery to the existing facility. In this respect,TFR is improving. Overall exports through all channels meant that export growth was only 0.8% in 2013 even though growth via RBCT was 2.8% but the 2014 forecast is expected to rise to 79mt and a growth of 7%. What is interesting is the TCM terminal in Maputo run by Grindrod South Africa where a shift in the cargo mix has taken place with a reduction in coal exports from South Africa and a swing to magnetite which comes from mines in Palabora in the North East of South Africa. Grindrod has recently stated the volume of coal that can move through Maputo will largely depend on rail capacity (supplied by TFR) and export markets. Therefore, with a short-term terminal capacity of 7.5mt at present, coal is only 33% of terminal utilization .The terminal also moved iron ore from the north of South Africa so swing volume between three key commodities gives the terminal some flexibility. Grindrod/TCM is aiming to add a further 4.5mt capacity to 12mt by 2016 (Phase 4A) and a further expansion through phase 4B to potentially 20mt. At the same time the terminal berth area has been dredged and by 2015 will be able to handle 70,000-tonne Panamax tonnage and therefore improve terminal throughput. With this in mind, there is no question that Maputo, with its closer proximity to the major coalfields, can add further opportunity to the South African coal producers. With the 70mt that moved through RBCT, the Atlantic volume increased a little in 2013 with a marginal decline to Pacific basin; however both China and India continue to take a large proportion of RSA coal (China 13.5mt and India 20.8mt) and this will continue in coming years. Most exports through Maputo are destined for Pacific markets but there is increasing demand into Turkey through this channel. Whilst there is sufficient bulk terminal capacity available it is also worth noting that RBCT still plans to take the existing terminal capacity to 110mt (a growth of 19mt) in response to junior miners’ requests to secure more export allocation (which today is quite limited). This expansion is still in the pre-feasibility phase. This would also require more equipment such as a tippler, shiploader plus additional conveyors, towers and silos. This type of expansion is a lot more economical than a completely new terminal as mooted by Transnet and it is hoped that sense will prevail and joint co-operation between RBCT/Transnet and miners will see this through. There does appear to be a difference in terminal throughput of iron ore vs. that posted via Trademap (the latter which is usually accurate) however there would have appeared to have been some significant recovery in RSA exports during 2013 and notably to China as per the table and graph. Some iron ore volume from the north east of South Africa is exported through Maputo TCM terminal, which could have influenced figures. What is of more concern is that whilst RSA exports have kept pace with the global export trade (5% of the market) this could weaken in the next few years. Saldahna exports will remain relatively flat over the next few years with various rail and terminal projects taking maximum capacity of the terminal to 65mt by 2018/2019. This will rise to 82mt by 2019/2020 therefore between 2015–2018 South Africa could see a decline in share on a global level with flat growth on this sector due to capacity constraints. one additional ship loader (total three units). This would bring port capacity to 82mtpa. As stated, all the upgrade plans are in place but the full effect of 82mtpa will only be available from 2019 onwards. This is an exciting and growing bulk area for South Africa. Data released through Trademap.org shows that Exports of South African Manganese ore surged again with a 24% growth to 9.8mt in 2013 following 16% growth in 2012. This has more than kept pace with world growth which also jumped strongly in 2013 but with a slightly slower 15% growth rate. Increasing production coming from emerging miners such as Tshipi, Asia Minerals and Kalagadi Mining was a factor in growth as well as general demand from steel markets. It is expected that a further 12% growth to 11mt will be possible for South African exports in 2014 pushing share to over 42.5% of global supply with the other major supplier being Australia. RSA has long-term resource growth and unfortunately for now limited beneficiation to alloys with shortage of power. The challenges continue to come not from supply but the ongoing logistical challenges of getting the product to exit port. Manganese ore is mined in the Northern Cape nearly 1,000km from its gateway port in Port Elizabeth and volumes reached maximum capacity in the last few years. Some of the bulk growth has been absorbed by bulk via Durban which handled a massive 2.8mt in 2013 a growth of 47% over the previous record in 2012. There is a limit to how much more bulk can be handled and this is now clearly visible via the graph on p53x showing the penetration of containers in this sector. An estimated 1.4mt moved in containers in 2013 and there is a potential to move 2.5mt (92,000 × 20ft containers) in 2014. Whilst on paper this is great for container operators, it is not really sustainable in the longer term from a logistics and cost point of view. Given the challenges on infrastructure it is therefore important that a solid plan is in place for the future and this is now formally under way through Transnet capacity upgrades. This is via both inland rail upgrades as well as port. The key start-up date for new capacity will be 2018/2019 financial year. For rail there is a process being followed which takes the existing line to a larger heavier haul scale. This will be via loop lengthening as well as extensions and new loops along the line on the main section between Mamathwane to Nqgura (new port). In addition, there will be an upgrade of existing wagons and a doubling of wagon capacity by adding 1,600 new wagons plus 121 new diesel and electric locomotives. This is required following successful trials of running a 200-wagon train with extra locomotive power last year. This, combined with the line upgrade, allows rail capacity to move from the current 5.5mt per annum to 16mt in 2018. There will be scalable port and rail capacity to move this to 22mt per annum by 2022 when axle weights can move from 20T to 26T. On the port side, Nqgura Manganese Terminal will be commissioned in 2018/2019 and will have two shiploaders with the ability to load two 80,000dwt Panamax vessels simultaneously, which is a massive ramp-up over the current operation in Port Elizabeth handling only one vessel at maximum 60,000dwt capacity. In addition, the terminal will have three stackers and related stockyard conveyors to stack ore on the stockpiles, with provision to add a fourth stacker in future. There will be two reclaimers and related stockyard conveyors to reclaim ore from the stockpiles, with provision to add a third reclaimer in future. The terminal layout will have four stockyard rows, with provision to add two additional rows in future and dual surge bins at the stockyards to optimize ship loading efficiency. This is an exciting development but the real challenge will be between now and 2018 in spite of the various bridging methods to take care of this and unfortunately with the growth of trade gaps may appear. The global chrome ore trade is around 31mt per annum and China with no local resource is now close to 40% of global trade with over 12mt imported in 2013 and this will grow further as China imports again grow in 2014. South Africa is a major supplier of chrome ore and whilst traditionally 35% of South African chrome exports move in containers this is largely a bulk commodity and most growth should develop this way. Chrome ore exports are updated below and shows South African exports of chrome ore grew by 45.2% in 2013 from 5.84mt to 8.48mt. Whilst there was only marginal growth in 2012 due to some shift into other more lucrative markets the general trend is for most growth being driven by China imports. South Africa represents over 50% share of Chinese total imports and between 76–78% of RSA total export moves to China. A key driver for growth has been a combination of cheaply available UG2 a by product from the platinum mining sector and also less ferrochrome being produced due to South African power shortages forcing a number of smelters to be closed. At time of writing a major strike now in its eighth week continues in the South African platinum sector and this will potentially limit the availability of UG2 supply and could therefore impact on anticipated growth for 2014. Whilst Chinese chrome ore imports are expected to increase 20% in 2014, this will potentially be met from other markets if RSA export volume is impacted by a protracted platinum strike. The longer-term future for South African bulk exports continues to look healthy although there is a likely flat to marginal growth rate over the next few years as infrastructure slowly catches up with and exceeds demand. Export volume will have good room to grow strongly once the state owned Transnet market demand strategy is complete. Aside from the main drivers being the base mineral mining industry and coal there is also ongoing good potential from the minor bulks such as grains and a range of smaller minerals. What is also important is that South Africa’s power crisis is resolved quickly so a number of base metals and minerals can be beneficiated. Whilst this might reduce some volume from commodities like manganese and chrome ore, it will add considerable value through the export of their alloys. Ronin® is a solutions company active in agriculture, industry and the mining sector. The company has been in operation for over a decade and has its origins in the grain management industry, writes E. Herridge – Ronin Marketing Specialist. Ronin® develops its own proprietary software as well as design and manufacture its own unique laser architectures capable of sourcing stock volume information in a variety of bulk commodity storage environments. Ronin®’s latest breakthrough solution is the ARTEMIS® 300 series multi-axis 3D scanner and proprietary software. The Artemis 300 series is a fixed solution that allows for data sourcing in high saturation environments and is capable of doing so over longer distances. The hardware element of the ARTEMIS® solution consists out of the ARTEMIS® 300 series scanner, a control/communication box and a dedicated PC on-siterunningproprietaryART® andAIMS® software. The ARTEMIS® 300 scanner takes an average of 10,500 point measurements on a surface per individual scanning cycle and offers exceptional accuracies when utilized to quantify hard and soft bulk commodities. The ARTEMIS® 300 solution can function with a single scanner or multiple scanners in a network, as required by the surface area of the commodity. Scans can be scheduled (i.e. for change of shifts), cycled or performed on demand. To enhance accuracy the ARTEMIS® 300 solution is customized to each client and application by factoring in the amount of points sourced per square metre, density of the points and the scan patterns of each ARTEMIS® installation. TheproprietaryART® andAIMS® softwareelementofthe ARTEMIS® solution calculates volumes, publishes reports and provides the graphic interface needed to operate the system. The PC running this software is usually located on the clients’ network for easy distribution of data to all relevant personnel. Scan results are immediately available on completion of a scan cycle and no additional calibrations or calculations are necessary post scan as all ‘spikes’ or irregular points are automatically eliminated by the software. Ronin® proprietary software also enables bulk densities to be applied to the calculated volumes, enabling reporting of bulk in tonnages. The software features a facility that allows for comprehensive ‘contents bounds’ to be built into the system for each individual storage vessel/area on the network. Flooring, walling, discharge points and structures are configured into the system, enabling accurate volumetric calculations for each bulk storage vessel or area. Further features enhancing the functionality of the ARTEMIS® 300 series software includes management facilities such as automatic Daily Reconciliations between actual physical bulk and pertaining book values and a Head Office Awareness Element that networks multiple sites for complete stock management and planning. Further integrations are also available to those clients requiring custom functionality in terms of applying weighted averages of grading, such as moisture, bulk densities and sizing applicable to each individual stockpile or storage vessel on the network. ARTEMIS® 300 literally place control over your bulk commodity stock right at your fingertips. enova Mining & Minerals South Africa, the South African market focused black empowered operating arm of the global Tenova Mining & Minerals Group, has been nominated to carry out a definitive feasibility study (DFS) for London Stock Exchange-listed Baobab Resources. The DFS will be done Baobab Resources’ pig iron and ferro-vanadium project in Mozambique’s Tete region. The iron ore resource to be mined in this greenfields project comprises magnetite and includes vanadium, with the pre-feasibility study test work having confirmed successful production of pig iron and vanadium as a by-product. The DFS, which is intended to run from January to September 2014, will cover beneficiation and smelting of 1mtpa (million tonnes per annum) of high quality, low impurity pig iron, with Tenova Pyromet consulting on the smelting plant aspect of the study. The DFS includes pilot testwork on the comminution and beneficiation characteristics of the ore at the South African minerals research organization Mintek, from which a four-tonne concentrate sample will be shipped to FL Smidth in the USA. The sample will be used for pilot work on the pre-reduction step (i.e. rotary kiln). The proposed flowsheet covers crushing, magnetic separation, direct reduction in a kiln and smelting of concentrates derived from the project’s iron ore. Test work on thermal coal from a number of producers in Tete proved positive for Baobab’s direct reduction process. The project’s strategic proximity to the requisite iron and steel making commodities of iron ore, coal, power and water presents an opportunity to add substantial value on site — through mine-mouth smelting of a pig iron product. A major challenge associated with the project is the remoteness of the site and difficulty of access. The logistics aspects of the study will evaluate transport infrastructure requirements, including trucking of coal to site, trucking of pig iron to a railway siding and transport by train to the ports of Beira or Nacala. The study will also take the significant infrastructure investments already being made in the region into account. These include rail corridors linking the Tete province with the coast that are being refurbished and expanded, as are the ports of Beira and Nacala. In addition, in conjunction with another consultant,Tenova Mining & Minerals South Africa will assess the possibility of co-generating off-gases for conversion into power. Tenova Mining & Minerals South Africa is the broad-based black empowered operating arm of the global Tenova Mining & Minerals Group.The Company focuses on the provision of total innovative solutions across the full mining & minerals industry value chain in South Africa. Tenova is a worldwide supplier of advanced technologies, products, and engineering services for the iron & steel and mining industries. In a move designed to broaden the availability of high- performance bulk material handling technologies in Southern Africa, Martin Engineering RSA has named Fluid Base Industries as its full-service distributor in Zambia. Fluid Base will be a source for all Martin Engineering RSA products and services throughout the country, including conveyor belt cleaners, transfer point solutions, flow aids, safety products and training, belt support products, silo cleaning and other field services. Fluid Base was formed in Zambia in 1997, initially focused on providing repair parts and services to the mining industry. The company is structured around a small group of technically- qualified individuals who deliver leading-edge components and expert service, including fabrication, installation and training. Jarrett has been working with Zambian mining companies and distributors for the last twelve years, and he finds excellent market potential and opportunities for service. Since 1944, Martin Engineering has developed innovative products and services for solids handling applications around the world. The company attributes its success to the design of field- proven, cost-effective solutions for “real-life” problems. Martin Engineering products are designed for tough industrial conditions, engineered for simplicity, safety and efficiency, and built to allow easy maintenance.